These wedge fries are a weekly occurrence in our home, and I love experimenting with new ways to dip them. The other day, I had a hankering for something rich and fulfilling, and this dairy free cheese sauce was the delicious result. It reminds me of the cheese sauces served by some fast-casual restaurants, but is wholesome and plant-based! Who doesn’t love roasted vegetables? Unfortunately, high heat baking isn’t always the best way to preserve nutrients in produce. However, the humble potato actually shines when given some oven time. Research shows that baking potatoes results in higher levels of resistant starch than other cooking methods. Resistant starch is a beneficial type of dietary fiber found in high-carbohydrate foods (like potatoes), which researchers believe can satiate (aiding in weight loss), improve blood sugar control, boost immunity, and perhaps reduce cancer risk. For an even bigger boost of this good-for-you carbohydrate, bake and cool those potatoes. Chilling further increases the levels of resistant starch. I often make a double batch of these wedge fries and enjoy leftovers from the refrigerator. For the fries, I always go with wedge cut for a couple of reasons. First, they’re more fun to eat in my opinion! They’re sturdier than traditionally cut fries and thus great for dunking in thin or thick dips. 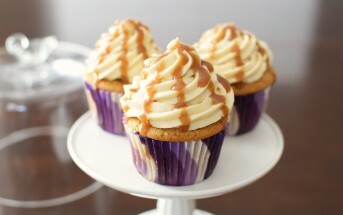 Second, they are easier to cut and more foolproof to bake. You simply turn the wedges upright, with their skin sides down, and bake, no flipping or racks required. The skins shield the sensitive cut tops and the shape and placement aid air circulation for relatively even cooking. But why ruin a perfectly healthy food with a sugar-laden, oily, or dairy dip? 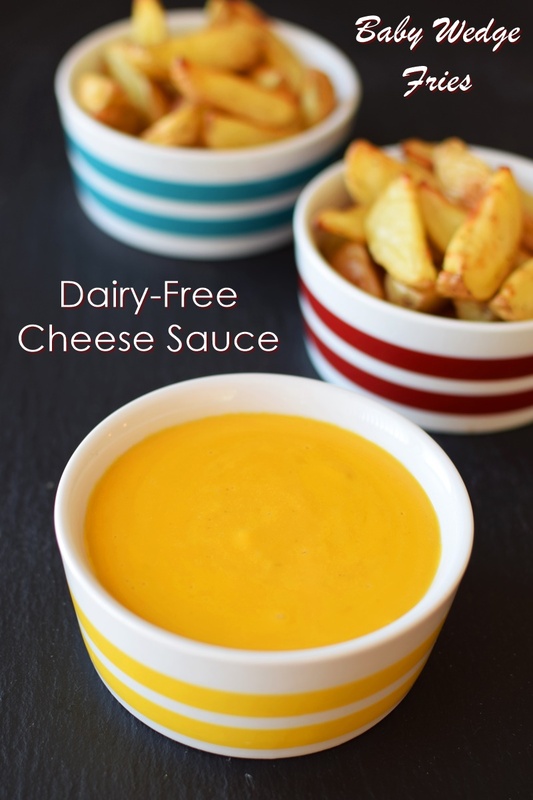 This dairy free cheese sauce is packed with even more nutrition and uses simple, wholesome ingredients. I use ground cashews for richness without the need for oils. You don’t want to pre-soak the cashews for this recipe. They soak up the liquid in the recipe and thicken better when ground fresh. 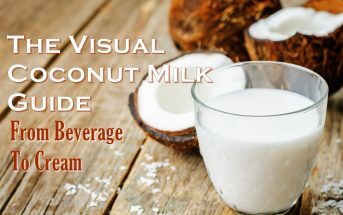 For the liquid, I amp up the creaminess just a touch more with Silk Unsweetened Cashew Milk Beverage. 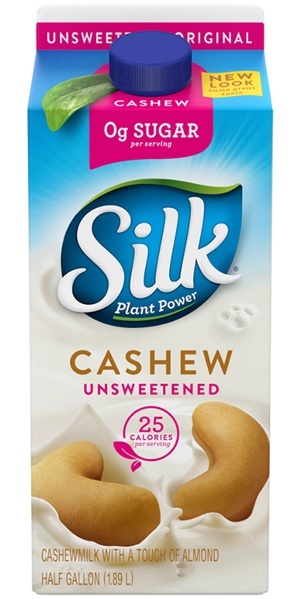 You can use one of their other unsweetened milk beverages, I just find the cashew milk beverage to be the most complimentary. To find them, see the Silk store locator. Also, sign up for the Silk Newsletter. Besides recipes and fun information, they often send out printable coupons. 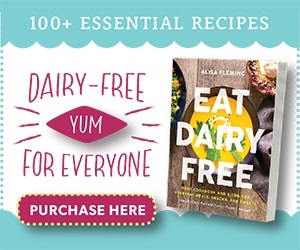 I actually used one to purchase the cashew milk beverage for this dairy free cheese sauce recipe! Scared of nutritional yeast? Don’t be. It’s rich in vitamins, including B12, which is essential for vegan diets. It’s a natural food that’s even considered “primal“, and is used more like a seasoning. It’s also very lightweight, so an 8-ounce bag will last you for numerous recipes. 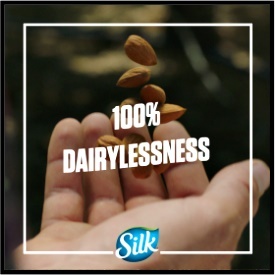 This is a sponsored conversation written by me on behalf of Silk, but the opinions, photos, and delicious recipes are my own. 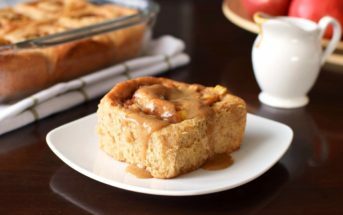 Sign up for the Silk Newsletter for more recipes and printable coupons! This dairy free cheese sauce could also be considered paleo-friendly, if potatoes are okay for you. If not, use 1 cup peeled, chopped sweet potatoes in place of the carrots and potatoes. I haven’t tested this particular recipe nut-free, but we also like this Vegan Queso Dip with chips or wedge fries, which is naturally nut-free. Spread the wedges out on the baking sheet and turn them all upright, skin side down. Bake for 30 to 40 minutes, or until lightly browned. While the potatoes bake, steam or boil the carrots and potatoes until quite tender, about 20 minutes. Pulse the cashews in a spice grinder or food processor until completely ground into a "flour", about 30 seconds. Add the cooked vegetables to a blender, followed by half of the cashew milk beverage, then the ground cashews, nutritional yeast, lemon juice, salt, and cayenne. Blend until smooth. Add the remaining milk beverage and blend to combine. Pour the cheesy mixture into a medium pan and bring it to a bubble over medium heat. Reduce the heat to medium-low and cook for about 5 minutes, whisking often, or until it thickens to your desired consistency. Serve with the baked baby potato wedge fries. Store leftovers in an airtight container in the refrigerator for up to 3 days. If it thickens too much, simply reheat with enough milk beverage to reach your desired consistency. Potato Notes: I use Dutch Yellow Baby Potatoes, which I purchase at Trader Joe's, for both the sauce and the wedges. They're thin-skinned and creamy, so they don't need to be peeled and blend up well. 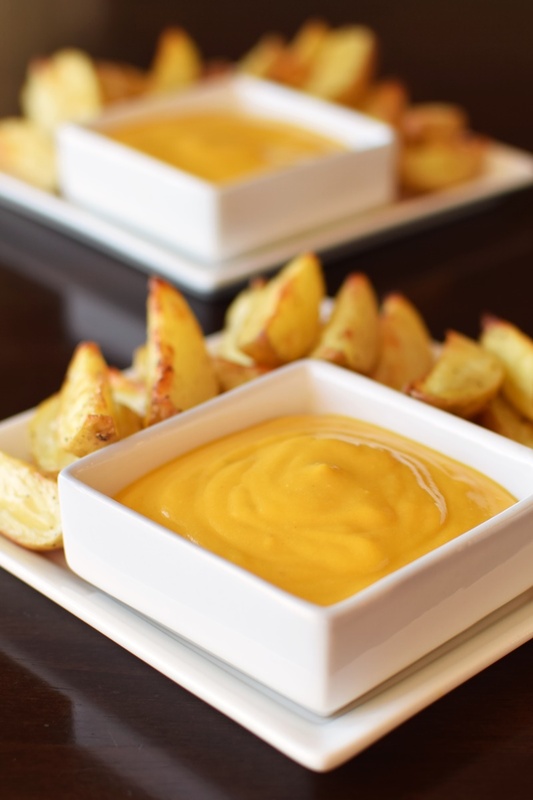 The dairy free cheese sauce recipe makes enough for a double batch of wedge fries. If you opt to double up, use two baking sheets to avoid over-crowding the potatoes. You can bake them at the same time, but switch the sheets on the oven racks half way through. Love that you use carrots! Looking forward to trying this. Great post! Carrots have been a secret ingredient in my “cheeses” for a while. 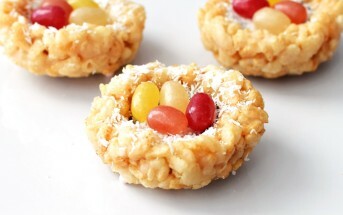 They add color, a little body and just a hint of natural sweetness for balance. Some cheesy recipes can be a little sharp / overly tangy. Oh wow! That color! <3 And it looks so creamy!! My favorite way to eat potatoes – in wedge form. Looks good! I love that you snuck some veggies in that silky cheese sauce! The baby potatoes are perfect for dipping! Yep, and they aren’t JUST sneaky, they actually add richness, too! That cheese sauce looks so delicious! Must try! I can’t believe you only eat this once a week! I think I’d want it everyday! I really must try your sauce – though I wouldn’t call it cheese (which to me is dairy), it’s such an interesting and healthy alternative. Wonder if I’ll be able to fool my friends and family:)? Wedges + cheese sauce!?!? Oh yes please!! I am able to justify putting vegan cheese sauce on EVERYTHING, because I love it so damn much. Looks delightful! The cheese sauce looks so great! Need to try this! OK I seriously want an enormous plate of greasy cheese fries SO bad right now thanks to you! 😉 I LOVE that this is dairy free, because I haven’t been able to really enjoy cheese fries in ages! YUM! Ok, now this is what I’m talking about! This cheese sauce recipe is brilliant- I love everything you have going on in there! This looks simply amazing, I am in awe of how versatile plant-based ingredients can be! 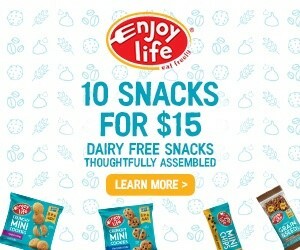 So glad to see a healthier substitute for a treat that is typically so unhealthy! It is amazing how natural foods can really come together into something unexpected and delicious. 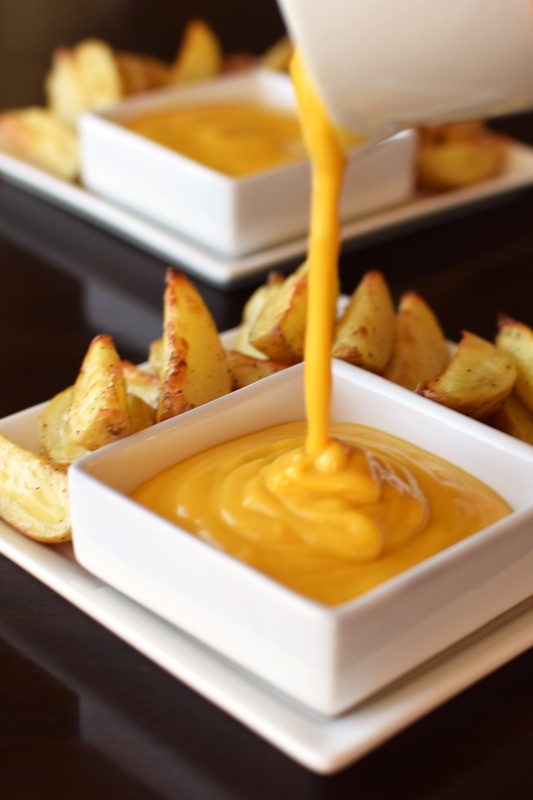 This cheese sauce looks so dip-able! I never thought of using sweet potato. Going to see if the boys like it for in their lunches. Hope the boys like it Alexa – let me know which version you try! This looks fantastic, Alisa! 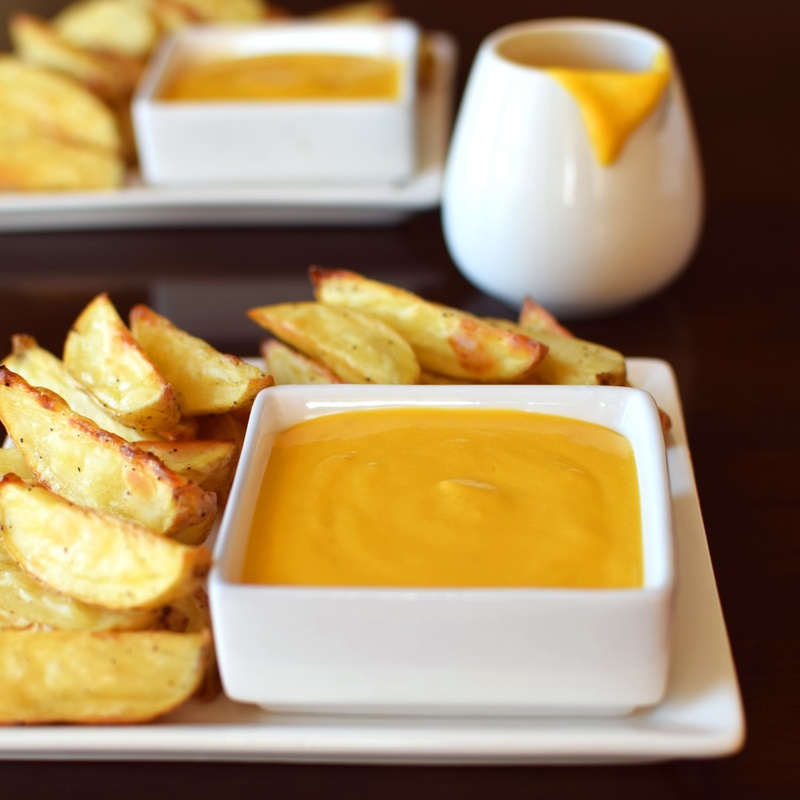 I love cashew cheese sauce, especially if I can dip yummy potato wedges in it. This looks like such a yummy snack, too! How would you say the cheese sauce tastes? I’m always wary of imitation cheeses – they just never taste right to me. Hi Keith, as mentioned, it’s like the cheese sauce at burger places. I’m not sure how else to describe it! It isn’t really an imitation cheese, it just happens to taste like that type of cheese sauce, but is whole food based, so you can easily tweak seasonings to taste, if desired. I LOVE dipping potatoes in my cheese sauce!! Your wedges look amazing. Nothing better than a thick crisp potato wedge…oh wait, yes there is. One that is dipped in cheese!!! HA!! Drooling now. Delicious! From potatoes, to even just using for some good old mac and cheese! This sauce is great! Yes, I developed it to be like that cheese sauce at burger joints, but I was thinking it could be pretty good with pasta, too!